Subscription boxes are not dead. Heralded as the newest, greatest ecommerce strategy beginning around 2010, subscription box services like BirchBox, Trunk Club and Dollar Shave Club have not only made headlines – they’ve made billions. In 2011, subscription brands made an estimated $57,000,000. In 2016, that revenue jumped to $2.6 billion – a 4,461% increase. Even Amazon is in on the game (of course). In fact, Amazon’s Subscribe and Save subscription service is the most used subscription service in the world, according to a McKinsey study. Here’s a quick overview of the most popular services men and women subscribe to. You don’t have to focus exclusively on subscriptions to make subscription ecommerce a profitable, predictable revenue driver. According to a study by McKinsey in February 2018, subscription ecommerce services are popular among young, wealthier populations. They are more likely to be ages 25 – 44, have incomes from $50-100K, and live in urban environments in the Northeast. Gender plays a big role here. 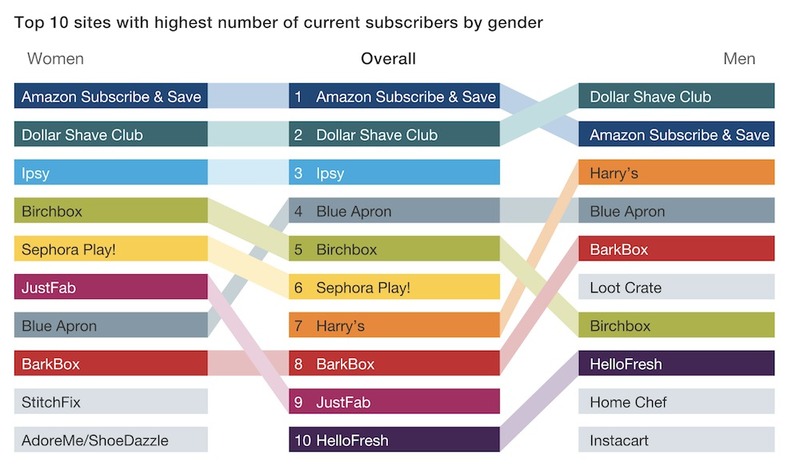 18% of male subscribers claim to be subscribed to at least 6 e-commerce services, compared to just 7% of female subscribers. 58% of ecommerce service subscribers have multiple active subscriptions. If I were a betting writer, I’d say based on the data, if you’re target market is younger than 40 and primarily in the Northeast or other larger cities – a subscription service would serve you well. But, there’s more to consider here. Replenishment: 32% of consumer subscribe for replenishment. Curation: 55% of consumers subscribe for curation. Access: 13% of consumers subscribe for access. Here’s the value proposition for each. Curation services are the most popular, providing aspects of both the replenishment and the access models. However, food & beverage brands are continuing to break into both the curation and the replenishment sectors. For those in the replenishment sector, fresh weekly delivery of new food items is becoming increasingly popular. Ready to Launch Your Subscription Business? Whether you want to launch a brand new subscription business or launch a subscription channel (or option) for your customers, get the PCI compliance you need and the ease of install necessary to increase revenue and save time – for both you and your customers. Wanting to try something new (25%) was the top response for curation subscriptions in the McKinsey study. A financial incentive (24%) was cited most often for replenishment subscriptions. A recommendation (24%) was the most-cited reason for access subscriptions. Let’s look at each of your options here. Many of the most popular services (including Birchbox, Dollar Shave Club, and Ipsy) charge relative low monthly fees of $10 or less. Others, such as Blue Apron and Stitch Fix, have higher fee structures and can therefore generate higher revenues on a smaller customer base; for example, Blue Apron’s average order value was $58 and its average revenue per customer was $245 in the third quarter of 2017. As you consider whether or not to launch a subscription ecommerce channel, think through if you can afford to low costs to $10 or less, or if you’ll need to follow a pricing structure in order to make margins work out. Remember: the lower the subscription price, the higher the customer volume. The higher the subscription price, the lower the customer volume. Cost of your subscription plays in to your overall average revenue per customer –– and will affect how much you can spend in order to acquire those customers. Your existing margins will help to dictate your possible price points. Think about reduced shipping costs using compact boxes with multiple items in predictable sizes and with predictable and relatively stable volumes. A reduced hassle of choice and immediate access to needed or desired items drive adoption for these two types of subscription programs. Advertise subscription options on your product page as well as on a specific landing page. Explain how the process works, and what customers get. This should include price discounts for loyalty overtime in addition to the product itself. All subscription box consumers stated that personalization overtime was very important for continuing to use a specific subscription website or channel. This aspect is a huge factor in continued subscription for consumers. If consumers perceive they are not getting their desired value, which can counteracted with increased personalization, they will churn (at about 40%). Use personalized email segmentation to follow up with consumers after items are delivered to understand their experience and perception of the box. Take that feedback seriously, and update all boxes moving forward to better fit the needs of the segments you are building out. Email segmentation tools like Klaviyo are important here. Begin small, and do what doesn’t scale. Include personalized notes. Ask for feedback. Get specific messages in the box and convey the purpose behind each one. Give folks a clear vision of the value. Let’s take a closer look at ecommerce sites using full subscription models or add-on subscription models to drive increased revenue. There are 5 top categories subscription ecommerce works for. The final category is a catch-all. If you don’t fit in the top three, there is a possibility for you yet. A perfectly curated, surprise and delight box from Fine Taste Club. Fresh Fronks deliveries weekly or bi-weekly fresh almond mil products to customers’ doors. Atkins sells refillable meal kits to help their customers reach their goals. The Beer Cartel offers a variety of recurring billing and subscription packs, based on your beer drinking needs. This is a perfect example of curation subscription. Sincerely Nuts offers bulk pricing as well as recurring and subscription ordering. ArborTeas offers subscription refills for certain items –– and uses an FAQ page to help answer any questions about the program. Monthly wine delivery –– a perfect blend of replenishment, curation and access. Take coffee subscription services to the level level with clearly defined benefits, savings and convenience. A great blend of replinishment, curation and access, this subscription box allows you to customize your order, your delivery and save money and time. This is access subscription ecommerce at its finest, including a clearly defined landing page with details on exactly what the program gets you. This is a replenishment subscription program for beauty items – hitting on the convenience factor for products you like, but use often and therefore run out of often. This is a choose your own adventure subscription box, where you can opt in for replinishment or curation choices. New Chapter takes things one step further with a subscribe CTA and a call-out to the savings you’ll have for the subscription over the one-time purchase. A simple replenishment subscription program. NBA Thunder is filling the closets of all their most loyal fans with a monthly tee club that is the definition of curation and access. A curation box for high-quality, fancy socks. Curation and access combine here for ultimate surprise and delight and value. I’ll leave you to your own conclusions on the value (and the high ratings!) for this product – but it is replenishment that keeps customers coming back. Make it easy for your partners to sell to your goods. B2B recurring orders for customers on-the-go. Functionally, in order to make subscription ecommerce work, you need a recurring payments tool. There are plenty out on the market – but ensuring yours enable checkout on your domain (not all do) and is PCI compliant is important. Rebillia’s subscription service is a game changer for those of us who need to keep up with the likes of Amazon. Offering a subscription service to our offering has not only delighted our customers but has helped us manage our business more effectively. You wont be disappointed! We needed a solution to allow our customers to conveniently re-order supplies for their gardens with as little hassle as possible, and MINIBC’s app provided an AUTOMATED solution that did that and more! Not only are we getting the re-order functionality but we’re also getting vault which is something our customers have been asking us for a long time now. We’re always trying to stay ahead of the game, so when we went looking for a solution we were really excited to have found MINIBC. – Arny Pollack, Director of Operations, Hydro Empire. What Makes a Good Ecommerce Subscription Platform? Here’s a quick ecommerce subscription platform checklist. Allow you take orders easily. Not send customers to a new URL for recurring order checkout. Allow for on-site recurring orders (rather than a new site where you’d lose SEO value and engagement). Be customizable, for both you and your end customers to maintain that personalized experience necessary to reduce churn. Be sure you ask all of the above questions to any solution provider you are considering working with. 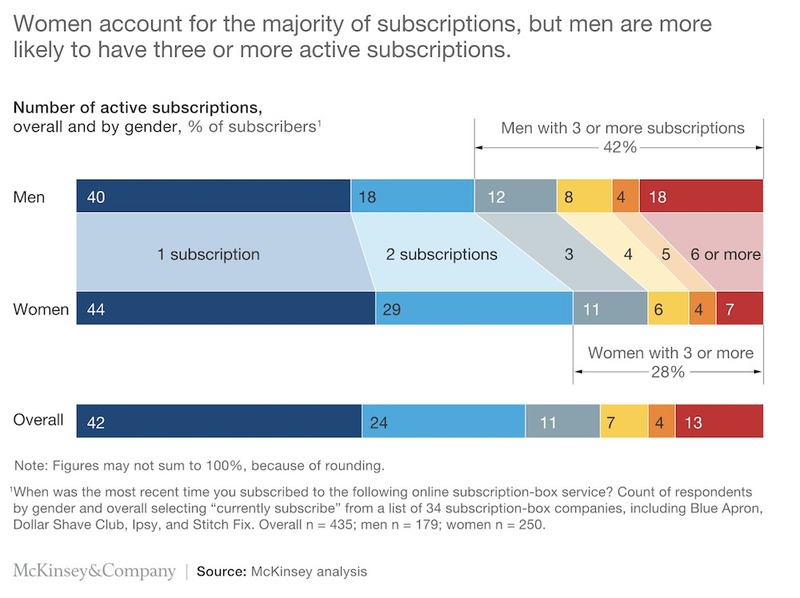 Remember: ecommerce subscription churn is 40% and most folks only subscribe to 2-6 boxes (women less and men more). Be sure your box fulfills a primary subscription website needs, either offering replenishment, curation or access to consumers. If you sell to folks unders 40 primarily in the Northeast, you are ripe for a subscription service. If you have a loyal base with high customer lifetime loyalty and recurring orders, a subscription service makes sense, and generates convenience for your customers (and more predictable revenue for you).